This piece started out as an experiment in painting mountains for a client, and turned into a bewitchingly creepy landscape once I put in the sky. I used salt to create the ghostly texture in the sky, which one person described as a crowd of people staring down. Spooky! I named it after a classic HP Lovecraft story that I haven’t even read (I know! Bad artist! No biscuit! ), but the name just seemed to fit with the looming sky and lunatic moon. 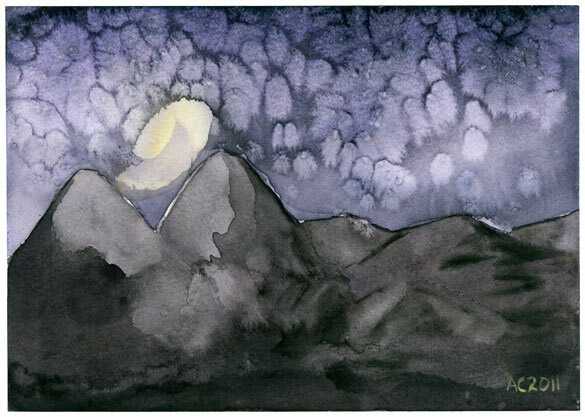 Mountains of Madness, 7″x5″ watercolor on paper, nfs (sold). 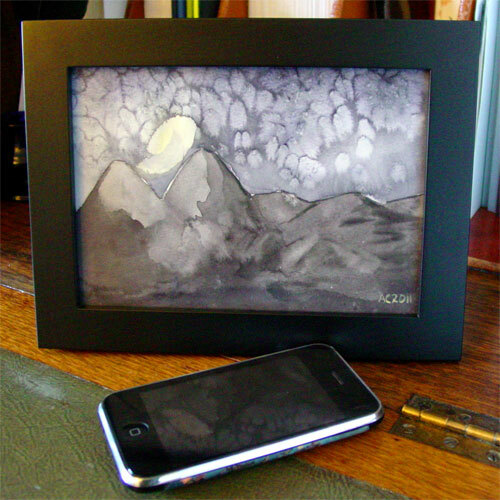 Here you can see it tucked into a frame, which can be included for an additional fee.